Did you just make a mistake when you tried to adhere your HTV vinyl with your heat press? Mistakes happy. 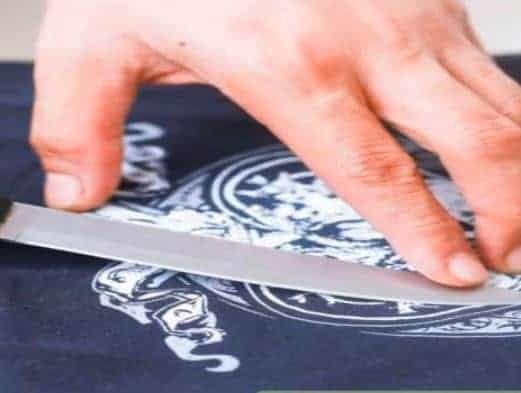 The beauty if when you can fix mistakes easily and that is where this handy post on how to remove heat transfer vinyl from a shirt comes in. Today we share with you 3 popular ways in which you can remove vinyl from a light or dark shirt. Find below 3 of the best ways to remove vinyl from a shirt. Our preferred method for removing vinyl from a shirt is by using HTV remover solvents. If you are wondering how to remove iron-on letters in an easy and fuss-free manner, then this is our pick for you. We have used and love any of the following heat transfer vinyl remover solutions. It simply tends to grab whichever is the cheapest when we make our purchases. Our favorite product is the AlbaChem 1020 Remover. This product is fabulous because not only does it do a great job in stripping the vinyl off, but it also does a fabulous job of removing the adhesive left over as well. This product works great with Siser, Precise, Silhouette, Cricut, Thermoflex, Chemica vinyl. Click here to check current price on Amazon. Whenever we can’t find our favorite AlbaChem 1020 Remover, we often look towards the TRW Magic Vinyl Remover. 1. Tumble dry the shirt at a high temperature for 5 minutes. 2. Whilst the shirt is still hot, turn it inside out. 3. Cover the entire back side of the heat transfer vinyl design with the remover. 4. Stretch the fabric so that the solvent can soak through and loosen the adhesive. Now, you have managed to remove the vinyl, but it is important to note that the HTV adhesive residue is still on the shirt and we need to remove this as well. 7. Apply more of the remover to the front of the shirt and gently use a white rag to rub away the residue. Wondering how to remove vinyl heat transfer without the use of chemicals? Another nifty trick is to simply use your iron and some tweezers. Again this might not be the best way to remove the actual adhesive from the vinyl, but it does a really good job of removing the vinyl. 2. Simply place the hole of the shirt over the iron (as if you were dressing a person). The backside of the vinyl should be snug against the iron (this is where the glue is), whilst the actual vinyl design should be facing away from the iron. 3. Wait for the adhesive to start melting – you will probably be able to smell when this starts to happen. 4. Simply use your tweezers and start loosening the vinyl from the corners and edges. We prefer using the solvent above this method due the fact that you can slightly damage the threads of the shirt whilst you are picking at the vinyl. But this is a nifty trick for when you don’t have a solution on hand and you just want to get on with it. Another way that you can try to remove the vinyl is by using both heat and steam. This doesn’t always work very successfully and often you might find that the adhesive residue stays behind. But it could be worth giving it a go, it works better when there was an error in the application of the vinyl and it never adhered properly in the first place. It is important to read the care instructions of your shirt before you apply heat to it, as not all fabrics react to heat positively. 1. Lay your shirt on a surface that can handle the heat. We like to use our ironing board. 2. Place a towel in-between the front and back layer of your shirt. This will protect that other side of the shirt. 3. Use a hairdryer on its hottest setting. Hold the hairdryer close to the design. The heat should cause the adhesive of the vinyl to become malleable which means that you can attempt to loosen it. Alternatively, you can also try using a wet towel on top of the design and then use a hot iron over the top, the steam should help to loosen the vinyl transfer. 4. Use tweezers and a sharp knife to gently loosen and scrape away the transfer. 5. Repeat the steps by applying more heat and scraping until all the transfer has come off. Of course, sometimes mistakes happen because you used the wrong type of vinyl, and other times it can be purely due to wrong temperature, time or pressure settings. Sometimes it is due to a dirty press. Step one? Make sure to purchase only the best vinyl for T shirts. Some types of vinyl work better with some types of fabric as well, so make sure to match your HTV to your fabric.